I've been eating a peanut butter sandwich for lunch literally every day for the past year, maybe longer. Before that, I was having a peanut butter sandwich for lunch almost every day. As you might well imagine, I've started to crave some variety in my lunch routine, but it's been hard to find viable alternatives. For one thing, I don't like lunch meat, and it's pretty expensive, anyway. Second, I tend to leave the leftovers for other family members to eat. Third, I don't like to eat meat three times a day because that much meat in a person's diet is correlated with an increased risk of cancer. Finally, I need something that conforms to the very-low carbohydrate diet that works for diabetics. 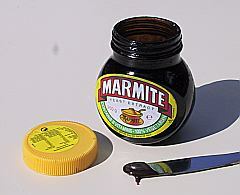 Marmite is essentially a reduction of brewer's yeast. What you do is you add salt to brewer's yeast, heat it up, boil it down, remove the husks, and you're left with a sticky, chocolate-brown paste. That's marmite. It's 100% vegetarian, has virtually no carbohydrates, and it's loaded with B-vitamins. So much so, in fact, that during WWI they gave marmite to soldiers to prevent them from getting beri-beri. In case you're wondering, marmite is more or less the same stuff as the infamous Australian vegemite. The recipes and tastes are slightly different. I opted for marmite instead of vegemite because all the information I read stated that fans of marmite usually like both marmite and vegemite, but fans of vegemite usually only like vegemite. I had my first marmite sandwich on Saturday. I put butter on one slice of bread, and then marmite on top of the butter. Then I put muenster cheese on top of the marmite, followed by another slice of bread. Basically a cheese sandwich with marmite on it. The taste was much different than I expected. All the reviews said it tastes like a combination of soy sauce and beer, which I guess is a fair approximation. However, it's extremely bitter. It tastes more like the bitterness you find in Swiss cheese. It was an odd flavor, but mostly because it was so unexpected. It was not repulsive. I finished the sandwich and was satisfied. Today, I ate my second marmite sandwich. This time, I knew what to expect, so it didn't catch me off-guard. In fact, it was actually pretty tasty! It's a good flavor to pair with cheese. I can understand why it's often put on toast for breakfast, because it would taste nice with a cup of coffee, or really any breakfast food that isn't overly sweet. If you like to try new things, I recommend that you give marmite a try. In the worst-case scenario, you might just decide you hate it. But in the better case, it's just one more healthy food option to add to your pantry, cheap and tasty-if-you-like-bitter-stuff.